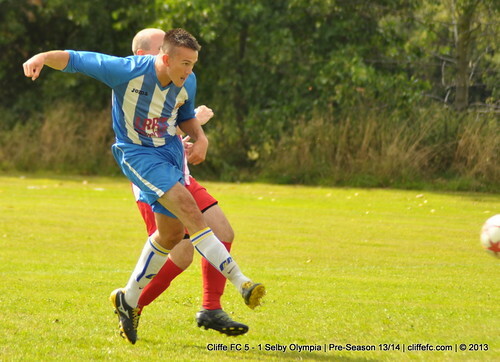 An opener from Tom Hogg, a first-half hat-trick from Ian Beckram and a second-half Andy Addison goal rounds off a 5-1 win in Cliffe FC’s final pre-season friendly versus Selby Olympia. ~ Keith Tiplady, 8th September 2013. 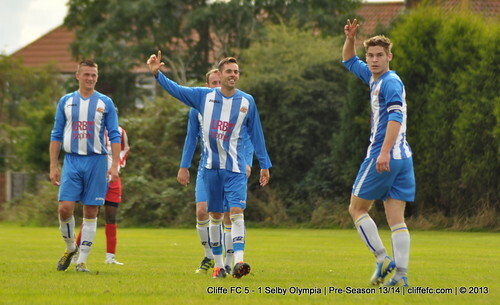 Cliffe started bright and Tom’s Robinson and Hogg linked up for Hogg to open scoring, 1-0. Cliffe doubled the lead within 90 seconds of the restart, Ian Beckram’s left foot drive evading the ‘keeper for 2-0. Beckram grabbed his second goal for 3-0, Hogg pouncing on a defensive error and squaring for Beckram. To complete his hat-trick, Robinson squared for Beckram to make the half-time score 4-0, HT. Tiplady made a number of changes at the half-time interval and Cliffe took a while to get adjusted, Olympia did grab a goal – a looping freekick by Damian Steblecki that made the score 4-1. Another positive from the game was the return of Andy Kirkham who played well, in action for the first time since getting injured away at Brooklyn last month. It was another Andy that made the final score 5-1, Andy Addison finishing off a headed chance from close range, 5-1 FT.
Cliffe FC MOTM: Jack Healey. LRB Trophies Selby Olympia MOTM: Sean Nelson. Dave Hebson’s Cliffe Reserves bow out of the League Reserve Cup after a 7-1 defeat away at Brooklyn. James Grundy’s goal only counting for consolation. MOTM: Nathan Leach.